Blog Quick Quotes: Pattern Perfect with Donna! Hi everyone, before you know it the kiddies will be going back to school. Donna here today to host the blog for you. 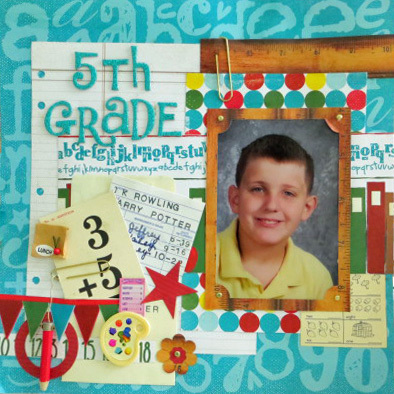 With Quick Quotes new line you will be ready to scrap all those awesome school pictures and make gifts for the teacher. Here are two creations I made using this new line. The first is my son's school picture, don't you just love the colors in the paper? I found a bunch of little embellishments to add to my cluster. The library card I printed out a blank one from a template I found on the Internet and then just stamped Harry Potter onto it, which happened to be my son's favorite book in 5th book. The second project, I took a Maya Road birdhouse and turned it into a little box, the lid lifts off and I can put in a gift card and some chocolate or tea, to give to a teacher. I found a little bell and a flag in my stash to help finish it off. I hope you enjoy the rest of the summer and be sure to check out the Quick Quotes store! That line has really fun colors. I like how you stamped the title onto the library card.